I have been receiving posts on my facebook wall that says, “Checkout the photographs of dead Osama” or “Secret Video of Obama Killing”and other similar posts that are nothing but spam fake messages. Once clicked, it gets posted to all my friends’ wall too. US govt. 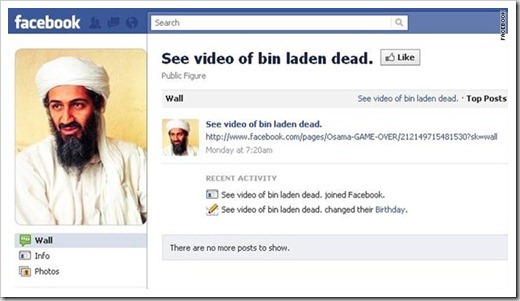 is yet to decide whether to release photographs of Osama’s body or photos of the D Day, there are plenty of fake photographs that ask you to click; irritatingly is nothing more than a viral chain of wall posts. Not only facebook walls, since the U.S. led raid that killed bin Laden on Sunday, e-mail inboxes and other social-media sites have been flooded with bad links that, at best, are unwanted spam and, at worst, contain harmful computer viruses. An e-mail claims to link to a photo of the terror leader holding a newspaper to prove he’s still alive. One e-mail, written in Spanish, uploads a Trojan horse virus when a photo link is clicked. And a phony Facebook page asks users to paste a script in their browsers which, in turn, spams their friends with the same link. On Wednesday Facebook Security posted a message encouraging users to be careful when clicking questionable links and to use the site’s "Mark As Spam" links to report that content. Now is probably a good time to take the Facebook security Quiz, if you have not already done so! FBI also released warning to prevent from clicking on fraud links. Ensure you take informed steps once you come across some fraud links irritating you with such content. Adjust privacy settings on your social-networking sites, like Facebook, to make it harder for friends or non-friends to post items to your wall. Do not agree to download new software in order to view a video. This can infect your computer. Read e-mails and social-media posts carefully. Malicious messages often contain poor grammar, misspellings and "nonstandard English." Report messages that claim to be from the FBI or other security agencies. Their names are often used to try to establish legitimacy. Facebook India Stats – Adds max new FB users globaly in April! Fake Osama bin laden links on FaceBook..
What you said about “Malicious mails often contain poor grammer, misspellings and non standard english is very true. In the late 90s and early 2000s I used to read that those mails originate from Nigeria. I now strongly beleive that they come from East Europe.